Living near the Dunwoody area and visiting local dog parks, we noticed there were very few, if any, places that offered pet daycare, boarding, and grooming that did not require battling traffic to drive to Sandy Springs or Chamblee. Sure, there are some big box pet retail chains that offer these services but it seems that their primary focus was on selling food, fish, or toys and not necessarily geared toward your pet actually having “fun.” Especially when playtimes are once or twice a day for 15 minutes in a tiny “play yard” with dogs of all sizes and temperaments. 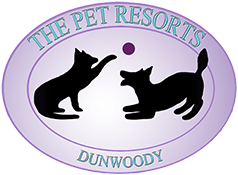 Hence The Pet Resorts Dunwoody was born. Our goal is to offer a convenient, well managed, pet daycare, boarding, and grooming facility that focuses on your loved furry friend instead of the bottom line. In this business, if you make sure your “guests” are well taken care of and having fun, everything else falls into place. And you, as the pet owner, can go on that relaxing, well deserved vacation or concentrate on the success of that business trip without having to worry! We do not hire seasonal help and we do not hire kids to care for your pet. Our staff is highly trained with years of experience working hands-on with animals. They are all Pet First Aid trained and can all read dogs signals which means we can prevent problems, not react to them after they have already occurred. That is a key difference in how The Pet Resorts Dunwoody is run. We also believe in making sure your furry family member is not cooped up in a cage all day only getting out a few times. Our guests play for hours at a time in monitored, climate controlled play yards. Don’t be alarmed if your pet lies around or sleeps for a period of time after pick up! We can and will reduce play time for older dogs or dogs that are less comfortable in a group. Just let us know! We didn’t like it when we boarded our dogs in the past and were surprised to see all sorts of charges at checkout over and above the published rate for walks, play times, beds, feedings, administering medicine, and even potty breaks! And we don’t expect you to like it either. So we charge one set, fair price for boarding and daycare. The only extras are for temperament testing, grooming, and special services for dog-reactive dogs. We think you will find us to be very unique and competent in the care of your pet as we have years of experience and many happy clients!